In 2016, LITE will award Community Economic Development Grants in the month of June. Grant recipients will be notified in May. LITE funds initiatives that directly create jobs, or leverage new jobs, and that include skill development for inner city residents who are unemployed or underemployed. Individuals participating in these initiatives face multiple barriers to full employment (for example, at-risk youth, single mothers, ex-offenders, etc). LITE divides their funding between Purchases (mostly of Christmas hamper goods) from inner-city co-ops and social enterprises (about 50%), and Grants to charitable initiatives (about 50%). How much the project contributes towards directly creating jobs, leveraging new jobs (such as through funding a coordinator position), or funds job-skill development. What LITE doesn’t fund are things like tools, supplies, and other capital. How strongly the project creates sustainable and long-term employment. How well the project addresses multiple barriers to employment. How sustainable the project would be without LITE funding. Is your organization seeking funding? If you are already a LITE partner, do you need to report on previous funding? Download a GRANT REPORTING form to report on funding received in 2015 (Deadline: March 04, 2016 – Grants). Download a PURCHASE REPORTING form to report on funding received in 2014 (Deadline: September 14, 2015 – Purchases). Do you have questions about applying or reporting? If so, please contact LITE. 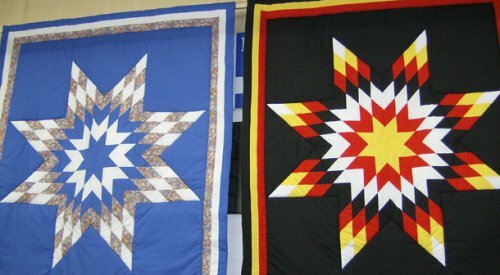 Every fall, LITE purchases beautiful star blankets from local aboriginal businesses & co-operatives to donate to Winnipeg charities. The goal of this project is to support local businesses while helping non-profit organizations in their fundraising initiatives.